When this challenge was announced I thought to myself..I know what I can do and I will kill 2 birds with one stone so to speak. I swap dominoes monthly with an online friend and our swap for this month was time so this was meant to be. I had some chipboard gears that I purchased from Artchix Studios and I painted them gold. I stamped my domino with Stazon Black with an Inkadinkado watch stamp. I then used Lettuce Alcohol Ink on the background. Applied my little fairy in the corner and that was it. Oh how time flies doesn't it? Thanks for dropping by and til next time stay cool in this heat!!! OH! Love your Steampunk domino! How fun! Thanks for joining us at Gingersnap Creations! Very cute, Les. I assumed you used alcohol ink to color the domino. Fun treatment! I didn't know you could do that to a domino! Thank you for your nice comment--glad you came by! And like your choice of background--it seems to suit the mood of your blog very nicely. Lesly...this is sooo cute! I love the green..and your little fairy! Isn't it great when you can get a twofer!! Hugs! This is amazing. 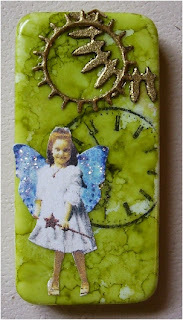 Love the lettuce green color!and the darling fairy image too. This is fantastic! I love the embossed gears over the inked background ! That looks great! Cute domino and great way to incorporate a second challenge. What a fun domino! Great job! Congratulations on this piece being chosen as a Ginger Gem at Gingersnap Creations, Lesley! Just a wondeful domino, congrats on being a Ginger Gem.